Uglies is book #1 in a series that includes Pretties, Specials and Extras. If I had read this book sooner (last year, maybe) I would have thought it was brilliant. But after reading Divergent and Hunger Games, this book seemed like "another crazy dystopia." I had hope at first that this book would be deep, but no, it's more of an adventure than a philosophical statement on the power of beauty in society. I liked this book, but it skirts real life issues like bulimia, anorexia, bullying and body dysmorphia. This is a quick read, especially if you skim through fight scenes and roller coaster romps like I do. If you want a book that goes just a bit deeper, read "Unwind." I hoped from the title that this book would be body positive in a memorable way, but that wasn't what the author had in mind. Read this book to go through a world of hooverboards, towns of partying new pretties, and bridges that tattle on you if you cross without authorization. Tally lives in this alternate future where we find her waiting impatiently for her 16th birthday to have this surgery that everyone (everyone) (everyone, no choice) (follow me here?) has to make themselves pleasing to look at. She sneaks into Pretty Town where everyone is post-op (and therefore over 16) and avoids their scorn of her ugly face by wearing a pig mask. Brilliant. On her way back meets a girl named Shay that tells her of a better land, one with no surgery and complete freedom. At first Tally thinks Shay is cray-cray. Why would anyone turn down a chance to be physically perfect, armed with lifelong perfect vision and perpetually unblemished skin? Then events unfold to make Tally realize she is a pawn in a totalitarian system that will remind you of Hunger Games and Divergent. 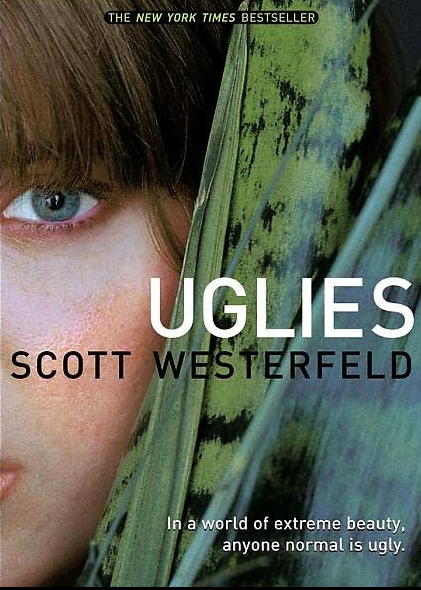 Like Catness, like Harry Potter, like Bella and Trix, the heroine of Uglies fights the system and wins just enough to keep some readers hooked on this series. This book ends with the beginning of the next book, as Tally turns 16 and closes this story with her asking doctors, "Make me pretty." I wish her luck - with 4 books left in the series, I have a feeling she will be having a lot of surgery.